"Establish My Temple for the Earth"
"With every coming of one of Earth's great Manus, a spinning action is anchored in the Earth that sets worlds spinning in a tremendous acceleration of Light, throwing off negativity and depositing the Consciousness of that Manu into the Earth. Because of our vested interest in the Victory of the Sons and Daughters of God, each one of the Manus holds the Earth in the firm embrace of their Eternal Consciousness. "Understand, Blessed Hearts, that where the Law requires that a more than ordinary God Consciousness be deposited into the conscious awareness of Firstborn Sons and Daughters, We come and We initiate new cycles. 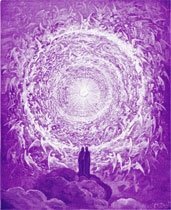 Just as your very own first incarnation was a new cycle for your lifestream, so there are those collective Earthly cycles that are deemed necessary throughout the ages. "O mankind, you are in the midst of just such a new cycle, the Manu Yuga. One where the requirement of the Law is not merely that you observe from the sidelines the activities that We, as Cosmic Beings, perform for and on your behalf, but that you also participate in the fulfillment of the Law. And is this not why every Dispensation and cycle of Cosmic Light that has come forth has held at its core a Grand Purpose for the individual lifestream? For we understand that you may be approaching your own life with a less than grand and glorious regard for those responsibilities which you are to accomplish day-to-day. Blessed Hearts, the Flame upon the Altar of your Heart desires to be fully engaged in Life, to set before you, as a Standard Bearer, the Divine Intent of your own Presence that you might fulfill every Good and Perfect Desire breathing forth from the very Heart of God. . . . "
"The Presence has never imposed a limitation on you. It is a Being of Love!" "That's all the Cosmic Law of your own Beloved Mighty I AM Presence wants. It wants you to turn away from that which has caused you distress, and coming the Way of Its Own Lifestream, living the Happiness and Perfection that takes you forward to Freedom. The Presence has never imposed a limitation on you. It is a Being of Love! "It won't even see what you do, unless it be constructive. The Higher Mental Body stands many times with covered eyes and won't behold your iniquity. That is the Mercy of the Cosmic Law! "Therefore knowing this point tonight, if you will take your stand, and you demand every picture [memory] that ever touched your lifestream that is not worthy to become Immortal in the Ascended Masters' Octave - and you demand that annihilated - if you ask My help, I shall see it is done!
" . . . Now please understand Me, because if you will do this, then there will not be that in your energy which a destructive force can tie to in order to control something in your world and produce disaster. That's the reason the Beloved Master Jesus made the statement: 'Evil hath found nothing in me to tie to.' And because of that, He had His Victory! . . . "
"The Redemption of the Earth"
" . . . I say then, God in you is the Authority for the redemption of the Earth, and all that the Hierarchies of Light can do is to wait and to listen for your Call. And then We must answer, for the Call does compel the Answer - and We must step forth and give the Energies that you invoke! For as We have become One with God, We realize that you are God. "As Moses said in the wilderness to the children of Israel 'Ye are gods!' (8) so I proclaim it to you this night! A God is one who has authority; and the Fire of the I AM within the Heart, within the Christ, within your I AM Presence, is the God to whom We must answer. And the answer always comes forth. Have faith then ! Have hope ! But above all, have charity toward the Ascended Hosts ! 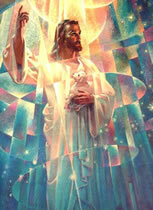 And let your charity be a liberal and abundant invocation of Our Presence; for in these times We must be called forth. We must come forth to do the Works of God. . . . "
When mankind began to turn from the Light, He was rendering Service in a similar capacity as a Messenger. He pointed out what the flow of their attention could lead them into: misqualified and imperfect forms and environments during the time of the Fourth Root Race. Mankind would not listen. He refused to go the way of the increasing number of people who were creating imperfection and sorrow through the misuse of thought and feeling - following conscious attention. 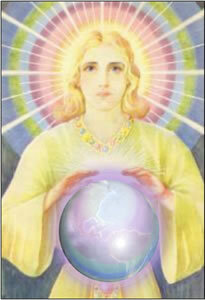 He attained His Ascension at that time, with the move into even Higher Realms of Cosmic Service announced on July 4, 1976 in Washington D. C.
The Great Divine Director was Saint Germain's Teacher, and He is the One known at Inner Levels as the Master "R". He founded the House of Rakoczy in Europe, and Saint Germain carried out His service and even used the Rakoczy name during a time. 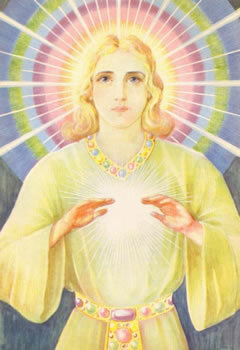 Saint Germain worked with Him in a simiar manner as Jesus worked with Lord Maitreya. The Great Divine Director is a Member of the Karmic Board, and is the Manu for the incoming Seventh Root Race.